The Government’s own CBO states the obvious. Jobs are destroyed before they were even created, what is $15 an hour times zero? The truth is, every time minimum wages go up, the free market responds with a vast array of solutions. Some will keep their jobs, and make more money. This is true. 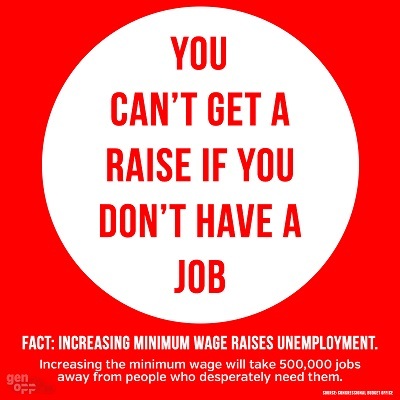 This is what makes it on TV and is trotted out before the voters as why we need to keep raising the minimum wage. But in order for those people to get that extra money, the quality of food will decline in many, but not all, locations. In other locations, the portion sizes will decrease. In still others, prices will go up, but in some, portion sizes will go down while prices go up simultaneously. In other locations, benefits will be cut for some employees while other employees are let go. Elsewhere, plans for a new store will be scrapped – so those employees will never even know they never got hired. In other words, the cost of raising some people’s income is spread out like peanut butter and absorbed by society at large in a multitude of ways which is why it is so easy for politicians to trick the public to accept it. The spread is thin, and so almost unnoticeable. A smaller burger patty here, a little kiosk there, a lower quality bun there, cheaper coffee here, less customer service there, but we pay. We do pay for it, and these millions of little changes is how we pay. The pain from those costs are not only socialized across everyone, but deferred over time in most cases. This is also why they never do a bulk increase in minimum wages, but an annual uptick so that the damage is gradual and stretched out over the longest period possible, spread as thin as possible, to make the destruction less obvious, but still gain all the immediate political rewards of passing the policy in the first place. That is why a proponent of the minimum wage can never answer the simple question, “Well if $15 an hour is so good, why not go to $30 an hour?” They can never, never, never answer this question, and why? Because they have ZERO understanding of economics. They can’t say that $30 an hour is any better or worse than $15 an hour because they don’t even know if $15 is a good or bad thing to do. They just want it. They want it now. It makes them feel snuggly about themselves to want it. It’s popular on Facebook. That is all they know. Idiocracy. You’re standing in it.